It’s 2016 and we’ve finally got some good tools for Go development, such as IntelliJ IDEA or Visual Studio Code2. But I’m a Sublime Text user for years, while still not ready to switch to other editor, tapping full potentials of this app is the optimal choice for me. Luckily I’ve found this: Golang tools, a fork of the abondoned plugin GoTools. Now, since the author doesn’t have time to update the doc, let me reorganize a brief introduction here. Install Package Control, then click ⌘+⇧+p & install below packages via Package Control: Install Package command. // Set environtment variables, use absolute paths. // Format source files each time they're saved. // A formatting backend (must be either 'gofmt', 'goimports' or 'both'). // Lint source files each time they're saved. // A lintting backend (must be either 'govet' or 'golint' or 'both'). // Enable GoTools debugging output to the Sublime console. Set some hotkeys to improve productivity. 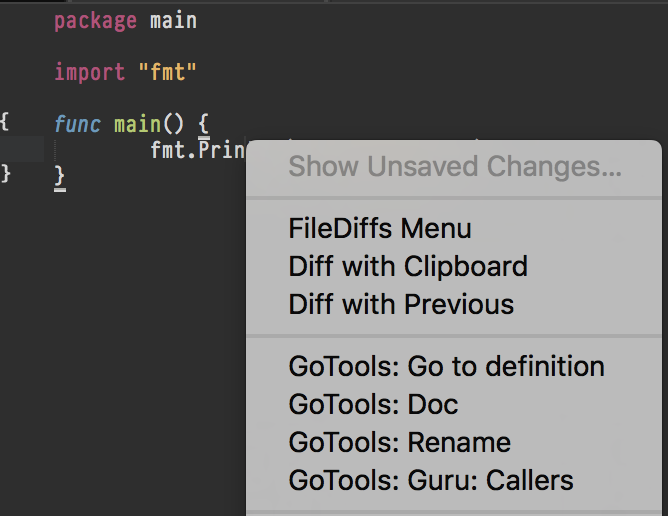 "button": "button1", "count": 1, "modifiers": ["ctrl"], "command": "gotools_goto_def"
It’s the best diff plugin for now, I’m using Beyond Compare Pro as a companion, great pair. Okay, now we built a lightweight yet complete Go IDE7, let’s rock! UPDATE 2016.10.10: GoTools 1.0.9 supports the new serverless mode offered by mdempsky/gocode, you can enable it by adding "gocode_client_mode": true to golang-config settings.